This will be the fourth year in a row that youth from our parish, Church of the Risen Christ in Denver, Colo., will be going to Guatemala. This year, we opened the trip up to the entire parish, and we have 18 adults joining 14 teens to build a home in Santiago. Each participant sponsors a child or aging person in Guatemala and will get to meet and spend time with their sponsored friend. Each year, our parish has been very supportive of CFCA sponsorship and generous with financial donations and other items to take to the children and families in San Lucas Toliman. At all Masses during one weekend in June, we asked for help to cover the cost of building materials for the house, estimated by CFCA to be about $3,500. In that one weekend, we collected more than enough to build the house. As a result of the generosity of fellow parishioners, one family will get to experience the joy of having a new home. The parish staff also approved giving the childrenís collections from all Masses as a gift to the CFCA Birthday and Christmas Fund. The children of our parish gave $800 to that special fund. What joy hundreds of children will experience because of the generosity of the children of our parish. But the generosity doesnít end there! 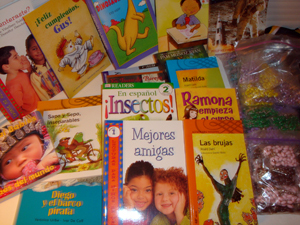 One parishioner purchased over $1,200 of new Spanish books for us to give to the school in San Lucas. We hope the joy of having those books will be felt for years to come. Another parishioner donated 35 pairs of new, protective goggles for the work site. A women’s group at our parish made more than 150 rosaries to take on our trip. 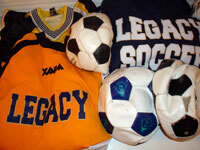 We also received 35 soccer balls, youth and high school soccer jerseys, shoes and warm-up suits. Those will bring joy to a lot of children who love playing soccer. And, at Vacation Bible School, parish children made little stuffed turtles with notes in Spanish that tell the children in Guatemala that “God loves you.” Joy, pure and simple! Generosity begets more generosity. As others heard about our trip, more donations kept coming in, and we will be able to help the San Lucas Mission continue many life-giving projects. Some parishioners accepted our invitation to pay for some of the more expensive parts of the home, such as doors and windows. This week we received a donation of 230 new Colorado T-shirts, with sizes ranging from toddler to adult. The people of San Lucas and Guatemala will see the generosity of their friends in Denver and Colorado. And we will see the joy on their faces. But the greatest gift of all will be just being with the people, or as CFCA says it, walking with the poor. From Colorado to Guatemala, GENEROSITY will bring JOY. The group from the Church of the Risen Christ leaves today for Guatemala. We wish them a safe and wonderful trip.